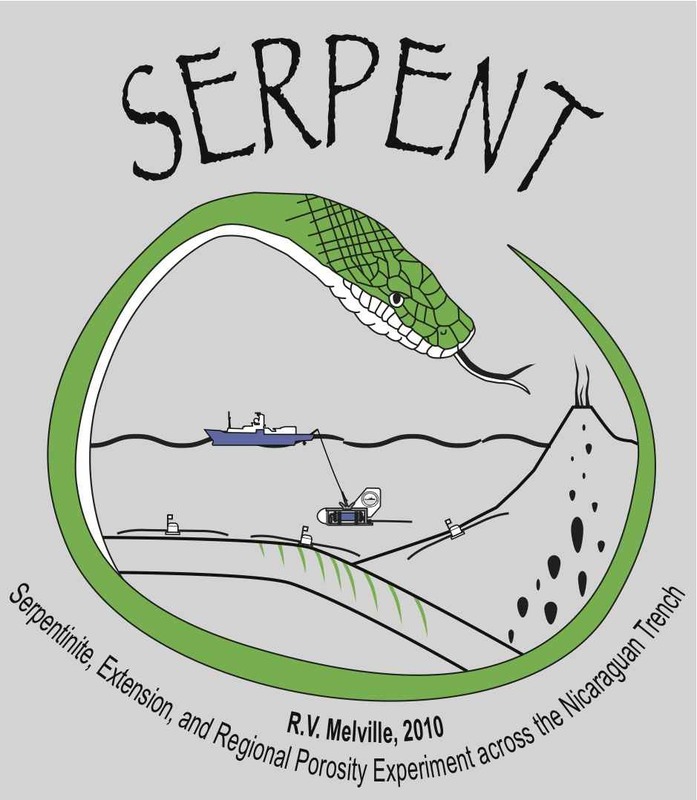 This is an NSF funded proposal to study the fluid content of the subducting plate offshore Nicaragua and Costa Rica, funded in collaboration with Rob Evans and Dan Lizarralde (Woods Hole Oceanographic Institution). 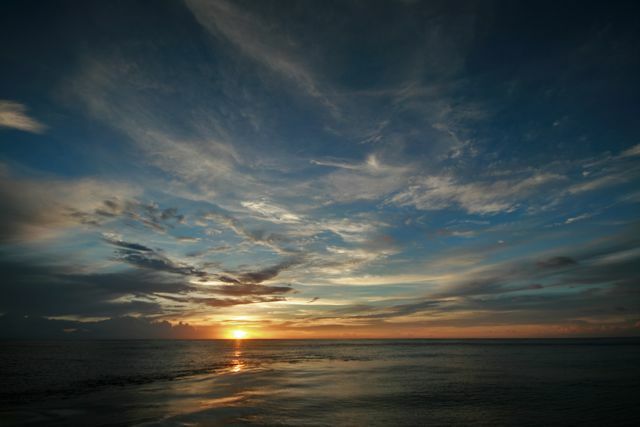 Broadband magnetotelluric (MT) and CSEM data has been collected along a 300 km long profile located offshore Nicaragua that coincides with a recent seismic experiment. Controlled-source electromagnetic (CSEM) deep-tows along the entire profile will image porosity variations associated with lithospheric bending and cracking near the trench, as suggested by previous reflection seismic imaging. Circular CSEM tows measure the anisotropic fabric of upper mantle conductivity in order to constrain the extent of serpentinization. MT data will constrain broad-scale and deeper conductivity features associated with plate subduction and dewatering. Download a copy of our proposal (14 Mb pdf), but bear in mind we've had to trim back the scope of work a little bit to accommodate a reduced level of funding from our original request. Our research cruise took place from April 14 to May 12, 2010. Read our cruise blog below for commentary, photos and videos of the cruise action. Naif, S., K. Key, S. Constable, and R. Evans, Melt-rich channel observed at the lithosphere-asthenosphere boundary, Nature, 495, 356-359. 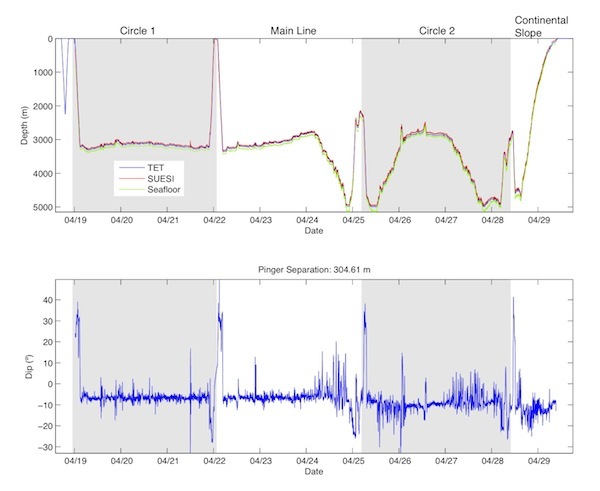 Key, K., S. Constable, T. Matsuno, R. Evans and D. Myer, 2012, Electromagnetic detection of plate hydration due to bending faults at the Middle America Trench, Earth and Planetary Science Letters, 351–352, 45–53. Click here to follow Steve's daily log (becoming a bit of a cruise custom). Click here to see the R/V Melville's current position and real-time camera images (updated every 10 minutes). Click here to see a Google Map with our upcoming marine MT and CSEM receiver deployments along the trench. Here's a shortcut to a folder containing HD versions of the cruise movies presented in the blog posts below. The movies are also available here on YouTube in case you'd like to embed them on your own web pages. May 10, 2010. KK: That's it folks, the survey is done! 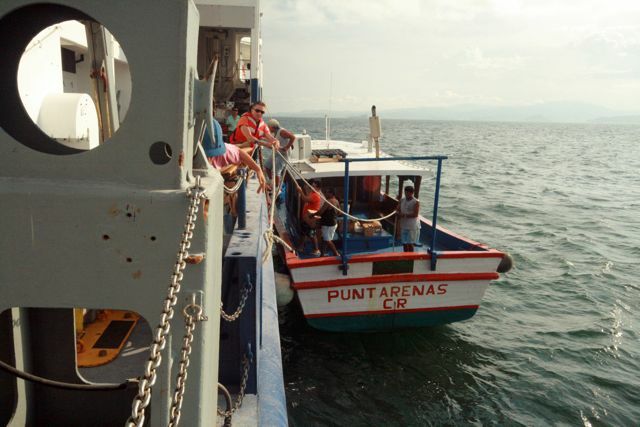 We recovered the final seafloor instrument at 7 PM last night and are cruising to Puntarenas today. 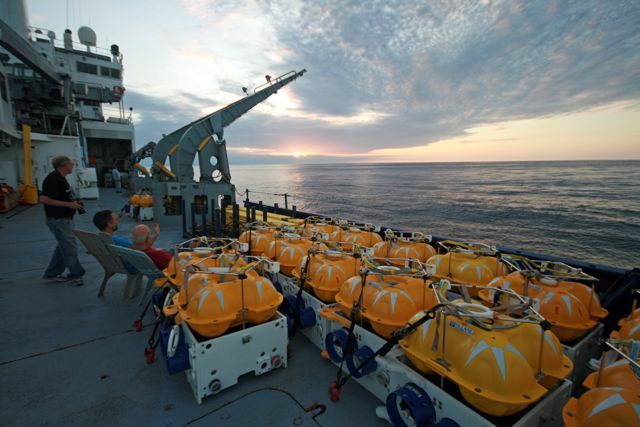 This is a good time to reflect on what we have accomplished this cruise using 54 seafloor EM receivers, 4 long-wire EM receivers, three Barracudas, two SUESIs and one Vulcan. We deployed the EM receivers a total of 56 times, collecting 54 data sets but losing two instruments. Of the 54 recoveries, all receivers recorded data and we only lost two main data channels out of 216 total (a 99% success rate, or 96% if you count the two missing receivers). We deployed each LEM once and all four LEMs came back with good data on all channels. We towed SUESI #1 around Circle #1, along the Main Line, around Circle #2 and then up the continental slope; after switching to SUESI #2, we towed along the trench outer-rise for 50 km and then about 1/2 of a mini-Circle#2, for a combined distance of nearly 800 km of CSEM tows! Our tail-end transponder (TET) worked beautifully for all the SUESI tows, returning depth recordings for the end of SUESI's antenna. After debugging the Barracuda/Benthos navigation system, we collected good SUESI navigation data for the Main Line, Circle #2, the continental slope and the outer-rise tows. 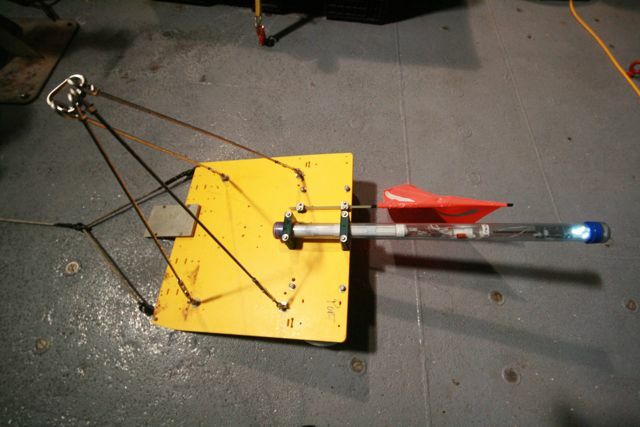 Our towed 3-axis electric field receiver Vulcan recorded data during the outer-rise and mini-Circle #2 tows. In summary, we have collected a huge volume of marine EM exploration data, from which we will be able to learn a great deal about the nature of cracking, extension, porosity and serpentinization of the oceanic lithosphere at a subduction zone. We will begin unloading the ship tomorrow and are looking forward to first beers, perhaps as early as tonight. Thanks to all members of the science team and the Captain and crew of the R/V Melville for their hard work this past month. 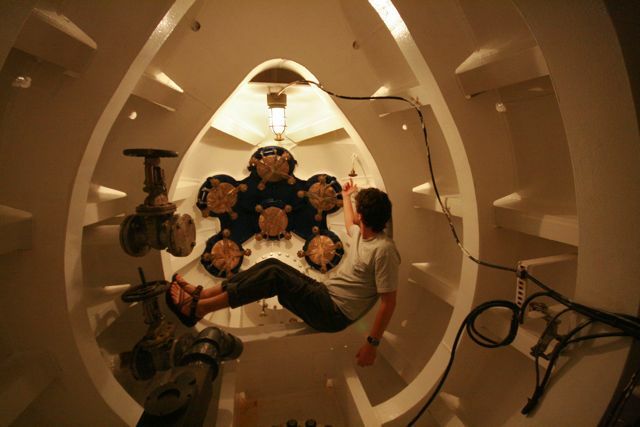 And a BIG thanks to our engineer Jacques Lemire, who, although never going to sea with us, helped design and build the instrumentation we relied upon for successfully completing this work. 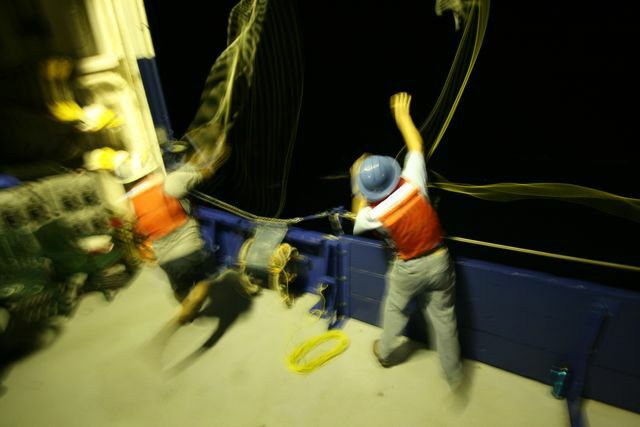 Steve and Jake had a grapnel-hook throwing contest during the last recovery which ended up looking more like a wild rodeo scene (you can read about the details in Steve's diary). Here's a photo I took of their initial synchronized throw. Karen Weitemeyer heckling Steve and Jake from the 01 deck before the final instrument recovery rodeo began. May 9, 2010. KK: Happy Mother's Day to all the mothers out there! 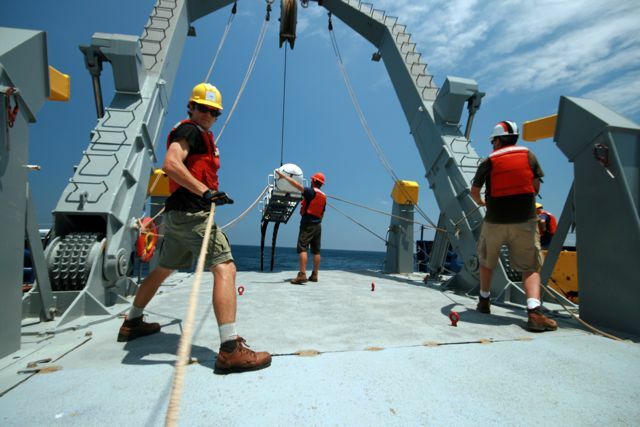 We are now winding down the survey with the recoveries of the last few seafloor EM receivers. However, the past few days have been quite eventful, as described below. 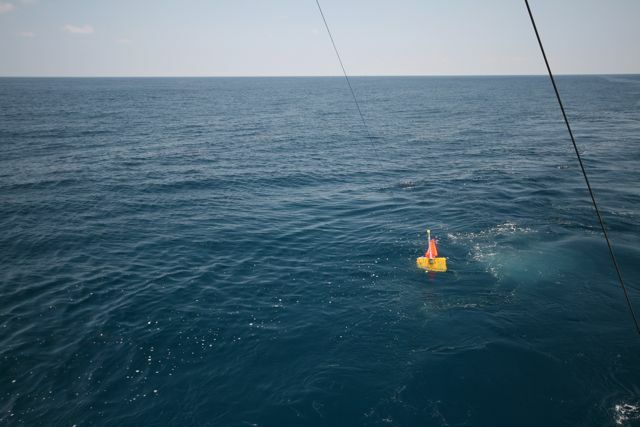 A few days ago when we started towing SUESI#2 down the axis of the trench, Tetsuo was manning the deep-tow station and promptly alerted me when SUESI's output current dropped to about 15 amps, rather than her usual 300 amps. John and Steve thought this was consistent with an break in SUESI's antenna so we pulled her back-up on deck and indeed found a problem with her antenna. The photo below shows where a termination connection on the long antenna pulled apart. This is the first time this has happened with this setup in weeks of towing during the past two years, so we were a bit disappointed. However, we brought along spare antenna sections and SUESI was outfitted with a new termination lead, and promptly re-deployed when the ship made it back near the start of the along-trench profile. David Myer, Cambria Berger and Jake Perez getting ready for re-deploying SUESI#2 though the A-frame. SUESI#2 being deployed with impeccable timing for a photogenic sunset. We completed the along-strike tow down the trench outer-rise and then turned around to conduct a mini-circular tow inside the trench, this time with a 11 km radius instead of the 30 km radius used for the two previous circles. Together, the 11 and 30 km radius circles could be useful for discriminating between upper mantle and crustal conductivity anisotropy. One issue we've had during the slow deep-towing out here is that the surface water currents have been quite strong, in the range of 1-3 kts. Rather unfortunately, the surface currents during the start of the mini-circle tow were coming from behind the ship and pushing the Melville faster than our desired 1.5 kts tow-speed. The ship's dynamic positioning system handled this by turning the ship sideways and using the Z-drives to push the ship backwards (sideways) against the water current, thereby making our slow course around the circle but also keeping our speed down. Since the ship was moving sideways, the deep-tow cable was being pulled sideways (to starboard), as you can see in the photograph of the A-frame below. Wire angles like this aren't pretty, but they are doable. However, the strong currents ended up dragging our Barracuda paravanes far to port, in fact almost in the front of the ship's course (see thin blue lines in the photo). Eventually we made it far enough around the circle that the ship needed to swing around its heading. Before the ship started spinning, the night crew pulled in the port Barracuda, but the bad wire angle blocked recovery of the starboard Barracuda. The ship then started turning to change its heading and within a few minutes the starboard Barracuda line went slack, was taken up by the current and became tangled around the hull of the Melville. That's when I got yet another "wake-up the Chief Scientist in the middle of the night" phone call. 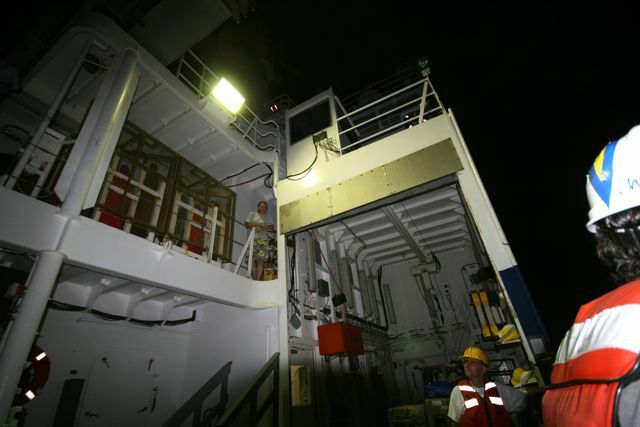 I raced out on deck and found the night crew, the Chief Engineer Paul Bueren and Captain Murray Stein on deck with the blue Barracuda towing lines all over the place. And the wind was blowing hard and dark gray choppy seas were slamming into the ship––not a pretty sight to wake up to. After lots of pulling on the various lines crossing the deck and rails, we managed to get the Barracuda right alongside the starboard rail of the ship, and then a big wave came by, the ship heaved and we all watched in semi-slow motion as the blue towline parted over the 90 degree bend of the rail and the Barracuda floated freely away from the ship. Captain Stein quickly drove the ship sideways and after a few minutes we were able to sling a hook and line around the Barracuda and pull it aboard. Rather miraculously, the Barracuda tow-lines crossing under the hull started moving freely and we pulled them all back aboard, thereby avoid fouling the ship's props. Whew! I stayed up for breakfast (French toast) and then caught a few zzz's before joining the Afternoon Scientists Society at noon. Arnold Orange and Cambria Berger enjoying a rest before we redeployed SUESI#2. Arnold Orange, Tetsuo Matsuno, Jake Perez, David Myer and Emily Carruthers taking a break. Here's somebody we haven't yet shown this cruise. This is Vulcan, our towed 3-axis electric field receiver. 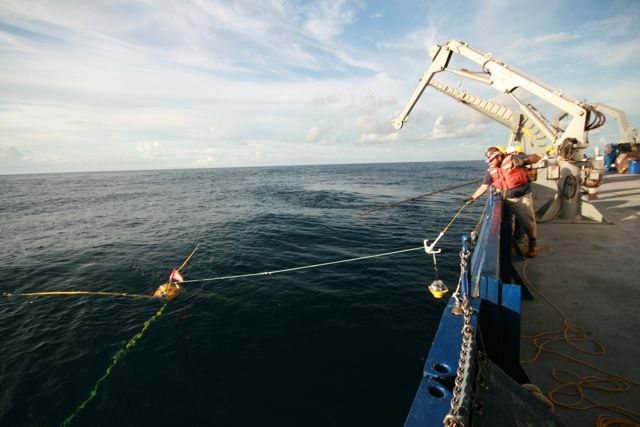 For our along-trench tow and the mini-circle tow we had Vulcan on a 500 m tether behind SUESI's antenna, collecting constant-offset multi-frequency CSEM data that should be useful for characterizing conductivity variations in the upper 100 m below the seabed. We recovered Vulcan last night and it's data is brimming with CSEM signal. 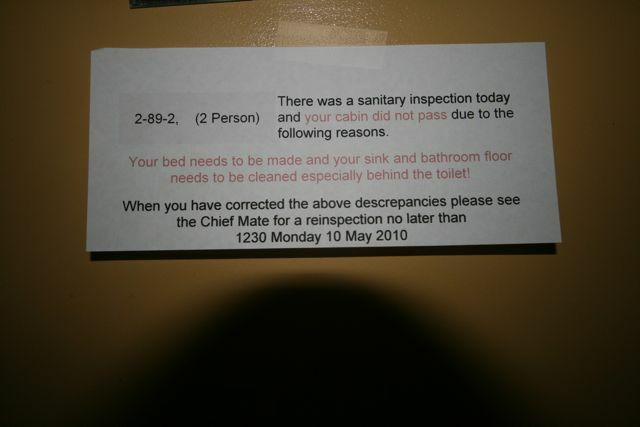 Yesterday we had room inspections, mostly to ensure that all the plumbing and infrastructure is in ship-shape. Afterwards, a few people in the science party found notices like this on their doors. Tsk Tsk! May 6, 2010. KK: Yesterday I answered some email questions from a Nicaraguan reporter and today we found this great article (in Spanish) on the La Prensa website. Its refreshing to see some journalism that is interested in what we're really doing. Muchas gracias Wilder Pérez! May 5, 2010. KK: At last, we've finished the first (and longest) phase of the experiment. 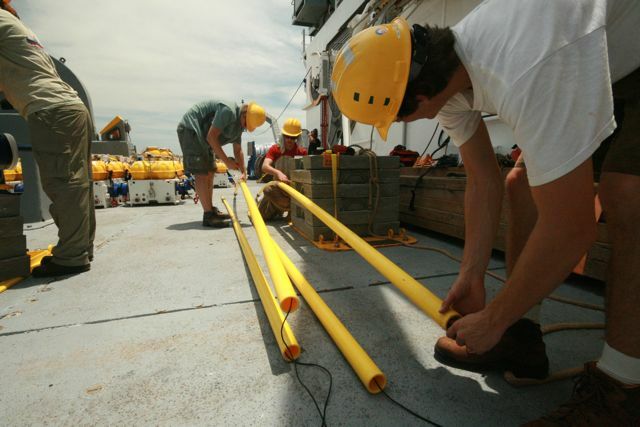 We have recovered 49 instruments (47 standard EM receivers and 2 LEMs), and all instruments recorded data. 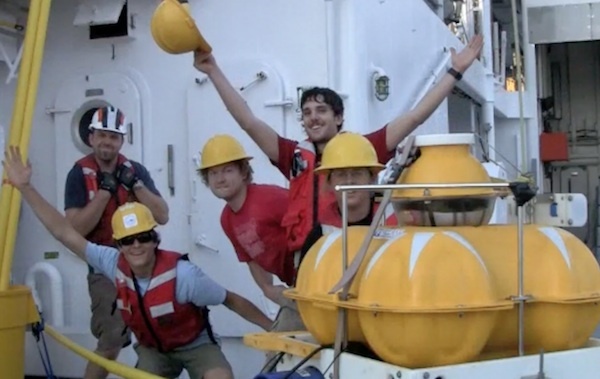 We left 7 instruments on the seafloor for Phase 2. Our spectrogram QC process (see the May 4 entry) spotted only two bad channels for our standard configurations, both due to breaks in the conductors in the cables used to string the long yellow electrode arms visible in some of the images below. So that's 2 failures out of 188 channels, which seems acceptable. On some additional spare channels of a few receivers we've tested various sensor and amplifier modifications, and as expected those channels have had highly variably quality, but we're learning lots, I think. 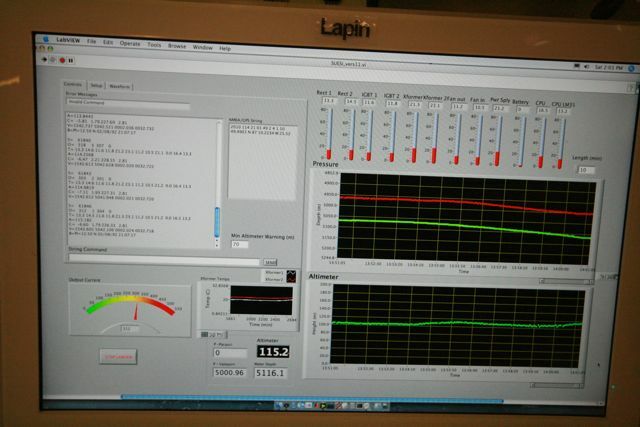 Out of four LEMS deployed, the two we have recovered so far both recorded some very beautiful electric field data. Unfortunately we did lose two EM receivers, Bandicoot and Quokka. However, we think that these instruments may have been accidentally released when we drove over them with the swath multibeam system pinging away, which rather unfortunately uses a similar frequency range to our EM receivers' acoustic release system. Hopefully these instruments are not RIP but MIA and will be picked up by local fishermen soon. 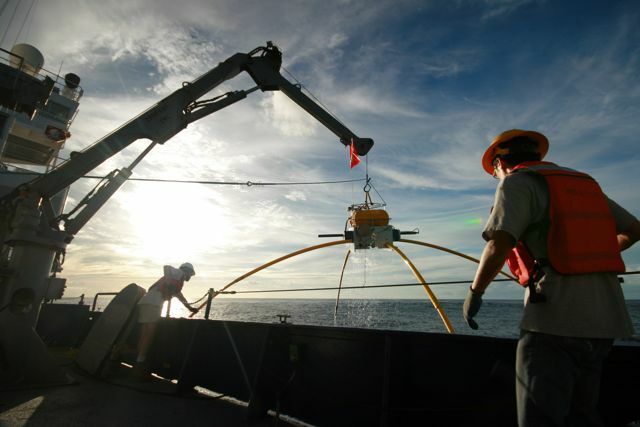 My bad for getting data greedy and running the EM122 multibeam system just so we could get extra high resolution bathymetry data in addition to tons of MT and CSEM data. I'm kicking myself for not being a bit more conservative, but hey, losing two out of 58 isn't that bad when you're putting sensors down in water up to 5 km deep. 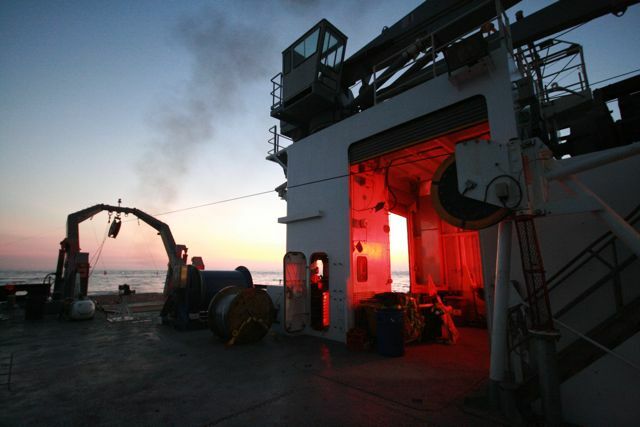 We're now beginning Phase 2 of the project, which consists of re-deploying two receivers and then towing SUESI and Vulcan along the trench outer rise and a second smaller radius mini-circular tow to look at shallow anisotropy. Of course another big THANKS to the day and night crews for their hard work with the instrument recoveries. Also, there's a rumor that Brent may have another epic cruise movie to upload tomorrow, stay tuned. A few days ago the San Diego Union-Tribune's new science writer posted a blog entry noting our cruise and this cruise blog. Then a local TV station requested a Skype video interview for their morning news show's live broadcast. So we set up a dedicated channel on the ship's modest satellite internet system and I prepared for a live broadcast scheduled for this morning. I woke up extra early after going to sleep at 2 AM and then cut myself shaving, but this was compensated by getting to eat ship's breakfast for the first time in a while (I was stoked to see it was pancake day and not biscuits and gravy day). Below is a link to a video of the broadcast, which you will see was heavily spun to be publicly accessible. Its not that I don't agree that Earthquake Hunters is a way sexier description of our research, but admittedly it is a bit misleading. For a rather brief moment I did consider telling them that we're using low-frequency, time-harmonic electromagnetic induction methods to map the three-dimensional electrical conductivity of a full-tensor anisotropic heterogeneous media, but opted instead to talk about seafloor imagers and scanners...you get the point. Many thanks to Fox 5 San Diego for covering the hunt! As I mentioned yesterday, the receivers with the styrofoam heads were due up today. 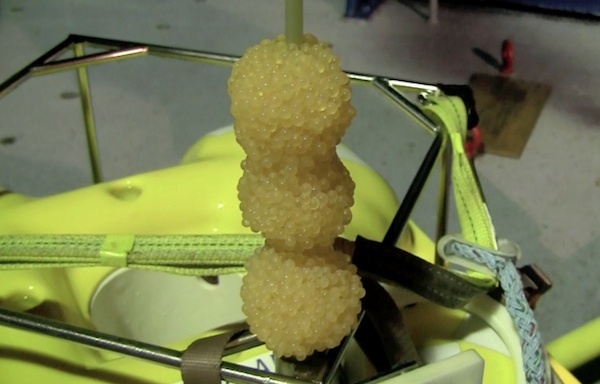 This picture shows a close-up of one of our seafloor EM receivers. The little mesh bag is holding the now shrunken foam heads. 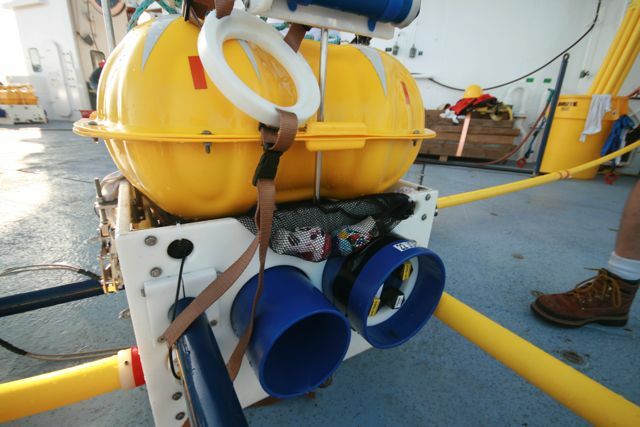 Other things you may be interested in: the yellow floats hold large glass balls that provide the buoyancy that float the receiver back to the sea surface; the skinny dark blue tubes are induction coil magnetometers; inside the medium blue tube lies our acoustic release system and inside the large blue tube is our data logger. 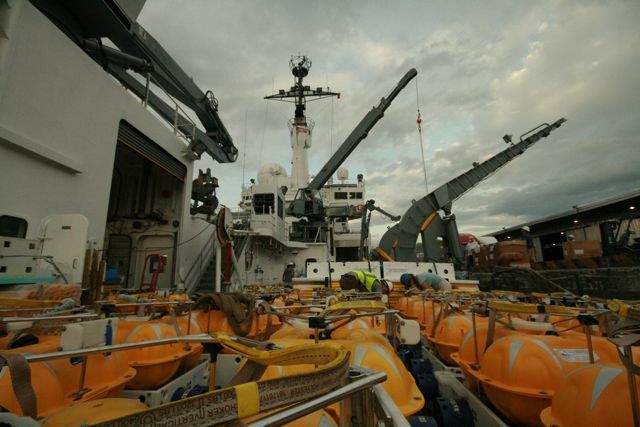 In the right of the photo is a steel-toed boot, a requirement when lifting heavy gear on deck. We have most of the heads back now, but I fear that at least two of them are on the missing instrument Bandicoot. 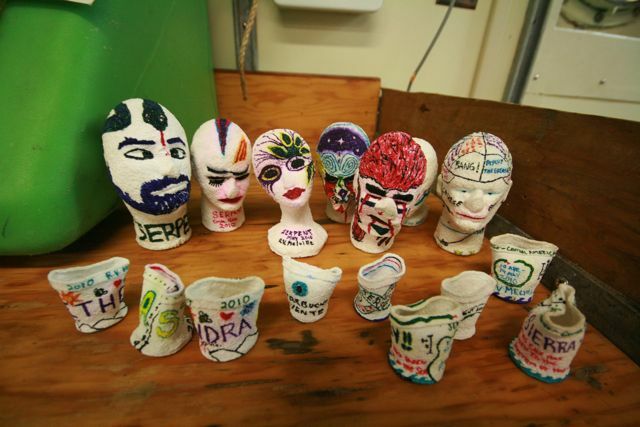 This photo shows some of the shrunken heads and some styrofoam cups. Quick tip for those of you who are reading this and will be attempting this on your next research cruise: stuff lots of paper towels into the cups before sending them down and they will come out round. We learned this too late and so most of our cups are all wavy and bent-up. The bearded head on the left went to about 3700 m depth, whereas the other heads made it to 4500 m or deeper and were compressed much more. 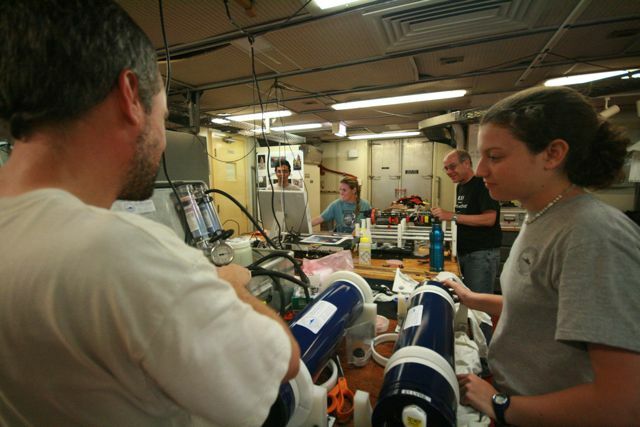 David Myer and Emily Carruthers using the vacuum pump to dry the air inside a data logger (the blue tubes), which helps ensure that short-circuiting condensation doesn't form when the logger reaches about 1–4ºC on the cold sea bottom. Tetsuo Matsuno, Cambria Berger and Steven Constable have a laugh in the background after I told them act busy for the photo. Steven Constable, David Myer and Arnold Orange enjoying another great sunset a few days ago. May 4, 2010: KK: One of the first things we do after recovering a seafloor EM receiver is to take the data logger inside the lab to get a time-tag of the logger's clock drift (usually around 0.2 s for these two-week deployments) and to download the 1.5 GB of data to a large hard drive and a back-up hard drive. We then run the entire data file through some software that computes spectrograms for each channel, which in simple terms are just large matrices showing signal power as a function of frequency and time for each channel. Since the loggers were sampling at 62.5 Hz for about 14 days, each data file has about 76 million samples per channel, which would be difficult to view in entirety as a time series plot. Instead, the spectrogram compresses all the data into a nice compact 2D color plot that can be used as a quality control check to verify (1) the instrument recorded something at all (2) the sensors and cables worked properly and (3) to assess the relative size of the desired natural-source magnetotelluric signal and the controlled-source EM signal with respect to any noise signals from water currents, vibrations, passing ships, instrumental noise, etc. 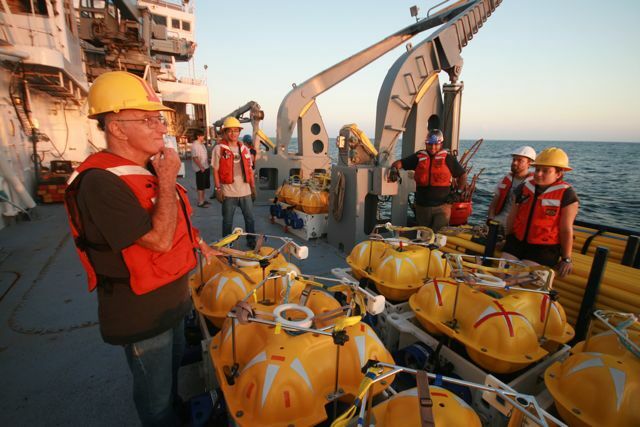 So far, out of 26 instruments recovered, all have recorded data. We found one bad channel due to a cable failure but most of the instruments have high quality data, with the exception of some occasional noise from acoustic pings on a few receivers and some strong water current noise on some others (though mostly limited to frequencies higher than the magnetotelluric bandwidth). Here's an example spectrogram plot for the Ex channel of electric field data from site 17, recorded using instrument Corella (Steve names each instrument after an animal that can be found on the Australian continent). The vertical scale is frequency, the horizontal scale is days and warm colors indicate higher power. This spectrogram is not corrected for the instrument's response, but you can still see that the spectrum is red (meaning there's more power at lower frequencies). The high power event on the 24th and late on the 26th are when the transmitter SUESI was towed by Corella and shows the multiple frequency harmonics of SUESI's waveform. The few other vertical yellow stripes are occasional noise bursts of very short time duration, probably from erratic acoustic pings from Corella's transponder, or perhaps some seafloor critters were climbing over the sensors (admittedly, rampant speculation here...). The yellow features at low frequencies that vary daily are the natural source magnetotelluric fields we will use to map the electrical conductivity of the crust and mantle to about 200 km depth. The bright red vertical stripe on May 4th (UTC) is when the instrument lifted off the seabed for its recovery. For the first few instrument recoveries, we thought we had some rather nice looking data, but then I started noticing that the instruments recovered yesterday (May 3) all had spectrograms with an orange-red region at low frequency range starting mid-day on May 2... these are the days magnetotelluric researchers live for (yes, we are geeks). Just to be certain I checked my two favorite web sites for the present Dst index and the current geomagnetic and solar activity report from NOAA. Yes! There was a magnetic storm that began May 2. NOAA's Space Weather Prediction Center reports this storm as arising from a coronal hole forming on the sun, which in turn created high solar wind velocities (peaking at 700 km/s). This strong solar wind pounded on Earth's geomagnetic field creating some nice magnetotelluric source field pulsations for our array of seafloor EM receivers to record. Below is a plot showing the magnetic storm, as recorded at sites 17 (receiver Corella) and 18 (receiver Bilby). 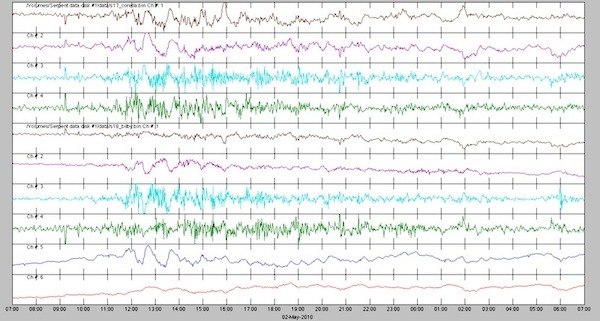 This figure shows 24 hours of seafloor magnetotelluric (low-frequency magnetic and electric) data starting at 07:00 UTC on May 2, after decimation to a 0.0125 Hz sampling rate. The top four channels show Bx, By, Ex and Ey for site 17 and the next four channels are Bx, By, Ex and Ey for site 18. The last two channels are some special DC electric field channels used on site 18. There's a strong correlation in the signal between the two sites, as expected since the magnetotelluric source-field is a laterally extensive low-frequency plane-wave that rains down onto Earth's surface. For seafloor magnetotelluric data, it doesn't get any better than this. We are stoked! 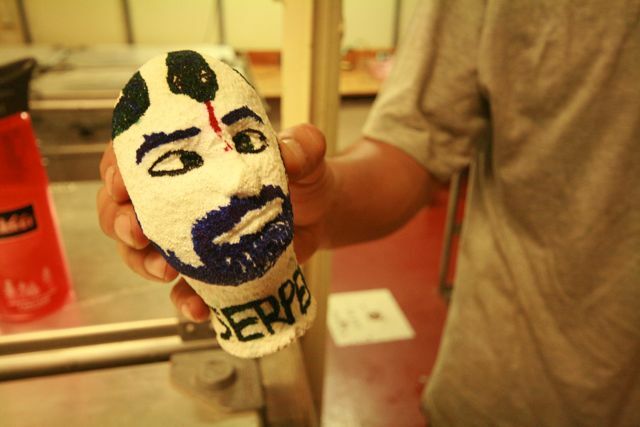 And tomorrow night we will be recovering the instruments with the foam heads, stay tuned! 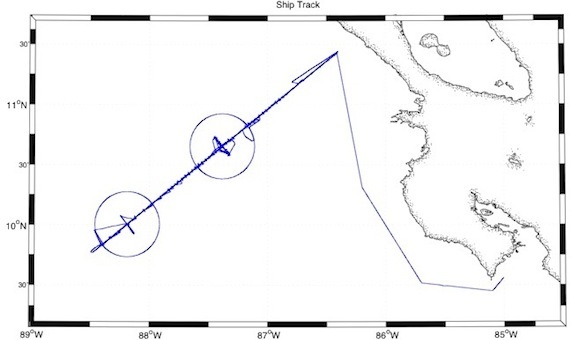 This map shows the ship's trackline since our departure from Puntarenas, Costa Rica on April 13. After arriving at the northern end of the survey line, we drove to the south-west deploying a seafloor EM receiver every 10 km, then every 4 km near the center of the profile and back to a 10 km spacing on western end. We opted for a denser data coverage in the center of the profile since this is where the seafloor faulting and cracking is observed. At the centers of the circles we deployed two LEMS, one with a NE-SW antenna and the other with a NW-SE antenna so that we capture the full horizontal electric field vector with these long antennas. Then we towed our deep-towed EM transmitter SUESI around the western 30 km radius circle, turned onto the main profile, followed by the the eastern circle, and finally up the continental slope towards the coastline. After bringing SUESI back aboard at the eastern end, we headed back along the survey profile collecting navigation data (acoustic slant ranges to the seafloor receivers) by driving the ship in a short cross pattern over each receiver, which will enable us to triangulate its seafloor position to within a few meters accuracy. 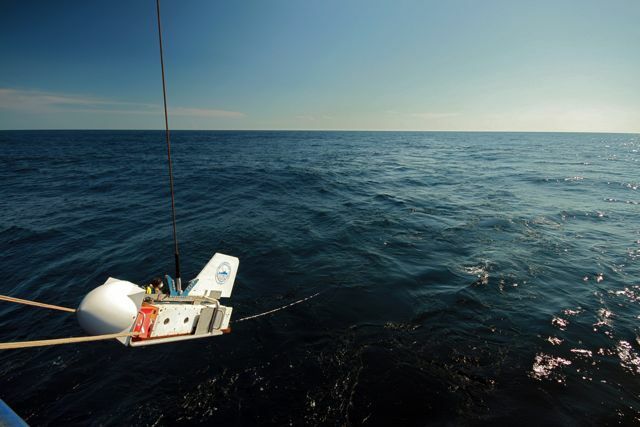 For the instrument recoveries now underway, we began on the western edge and are nearly to the eastern circle. We will leave about 10 receivers on the seafloor around the middle of this circle and will skip over these to recover the trench and continental slope receivers. After we finish the recoveries, we will have a good idea of the amount of time left before we need to return to port. We plan to use any extra time to tow some along-axis profiles on the trench outer-rise using SUESI with our towed EM receiver Vulcan tethered about 500 m behind the far end of SUESI's antenna. This along strike data will be useful for constraining differential fluid flow along the length of the seafloor faults. After this we pull up the remaining seafloor EM receivers left on the trench outer rise, and head back to port in Puntarenas, Costa Rica. This figure shows the depth measurements for SUESI's deep-tows so far, as recorded by a pressure gauge on SUESI and another one located 305 m behind at the tail of her antenna (TET: tail-end transponder). 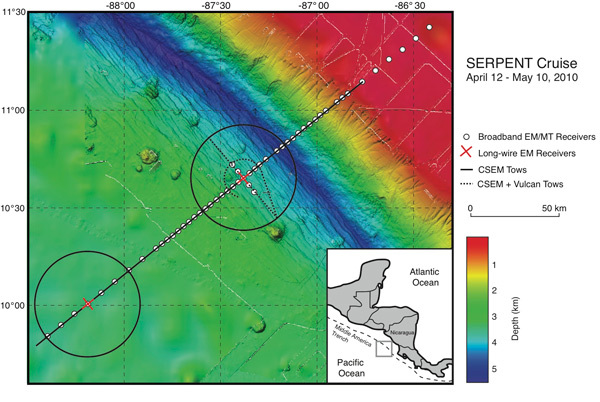 The green line shows the seafloor depth. You can see that we towed SUESI about 100 m above the seafloor, but pulled her up to shallower depths during the turns between the circles and the main profile. 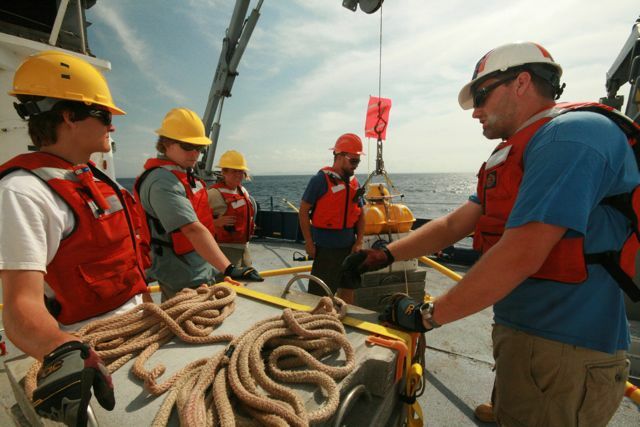 We pull up during the turns because the ship can sometimes lose speed then and SUESI, whose drag acts to kite-up the deep-tow cable, could then drop towards the seafloor faster than the winch could haul in the cable. Note our world-record setting CSEM tow depth at 5000 m in the trench at the end of the Main Line and Circle 2 (the eastern circle). The bottom part of the figure shows the vertical dip of the antenna as computed using the two depth measurements and SUESI's antenna length. SUESI's tail has mostly been flying lower than her head by about 7 degrees or so. 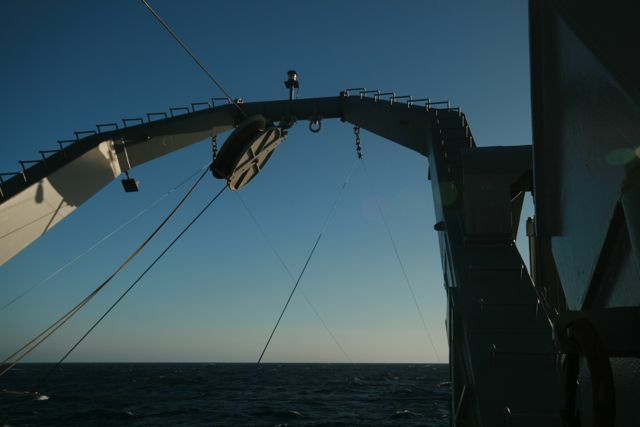 You can also see the angle change by up to10-20 degrees whenever we lowered or raised SUESI as she passed over the rugged seafloor topography . For example, see the dip angle when SUESI is being lowered into the trench at the end of the Main Line on April 24th. May 2, 2010. KK: The instrument recoveries have begun in earnest. 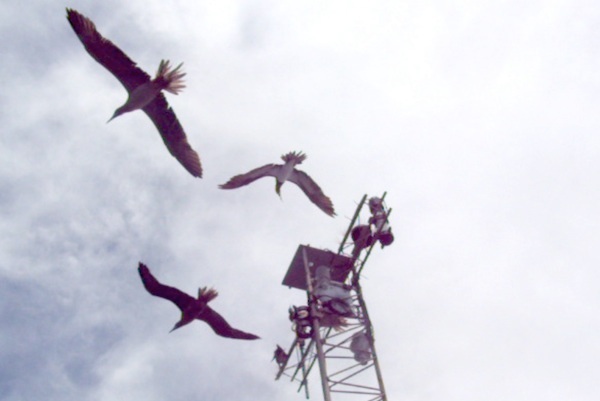 Here are a pair of Brown Boobies resting on a receiver as the ship approaches. Photo by Arnold Orange. Jake Perez, the noon-midnight shift's chief grapnel thrower, tosses the floating grapnel towards a receiver's stray-line. Jake hauling in the grapnel hook after successfully snagging a stray-line. 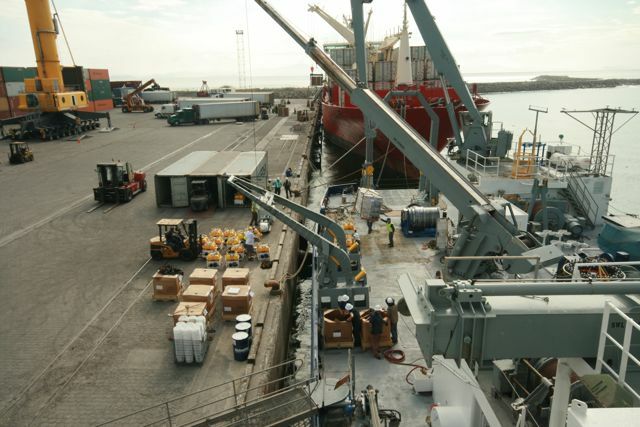 The yellow float attached to the stray-line contains a GPS unit , flashing beacon and a radio modem, so that when the instrument reaches the sea surface, it automatically radios the ship to alert its presence and location. This can be of great assistance for ensuring a successful recovery, particularly at night or in foggy conditions where visibility is reduced to zero. The stray-line also makes the recovery relatively easy since we only need to snag it with a grapnel, which is much easier than trying to hook the instrument with long poles. David Myer and Tetsuo Matsuno about to grab the electrode arms as an EM receiver is craned aboard. Today we celebrated Chris Armerding's birthday. Jake made a poster-size card and the Melville's cooks Richard and June baked a chocolate cake, which prompted us to sing to Chris during lunch. 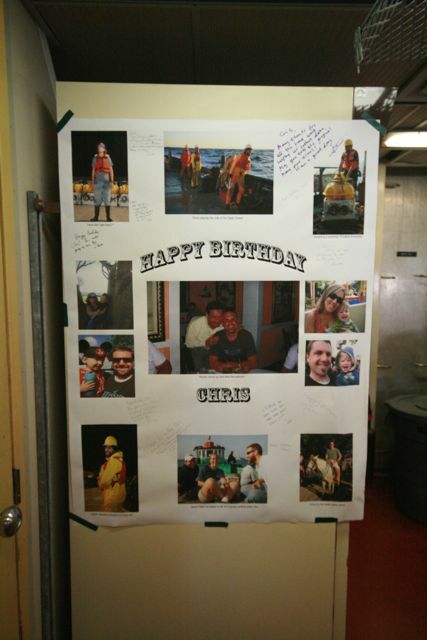 Hope you have a great year Chris, and thank-you for six years of hard work with the Marine EM Laboratory! Paul Bueren, the Melville's Chief Engineer, working the grill. 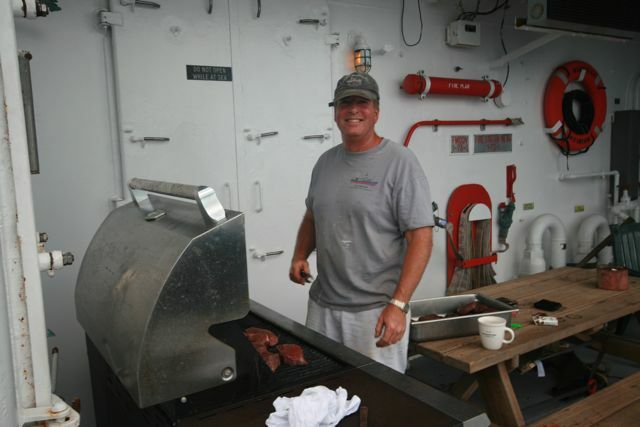 On the Scripps research vessels, the Chief's Sunday dinner grill is a tradition, lightening the load for the ship's cooks for one night each week while whetting the deck crew's appetites during the hour before chow-time. May 1, 2010. 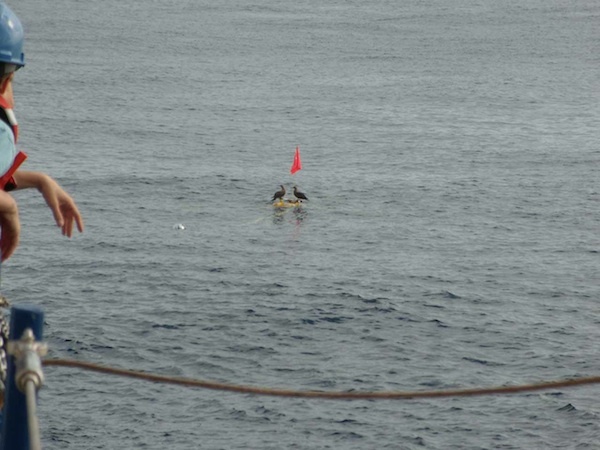 KK: Two nights ago I received a middle of the night phone call from the midnight-noon crew letting me know that a receiver named Occie prematurely released from its anchor, floating to the sea surface in front of the ship while we were still deep-towing SUESI behind the ship (oh man...why didn't they call Steve again this time...). I knew the late night wake up call was bound to happen sooner or later, and I was well into deep sleep when it did. I spent the rest of the night and morning helping them recover SUESI and then Occie, and finally to begin the receiver navigation survey. 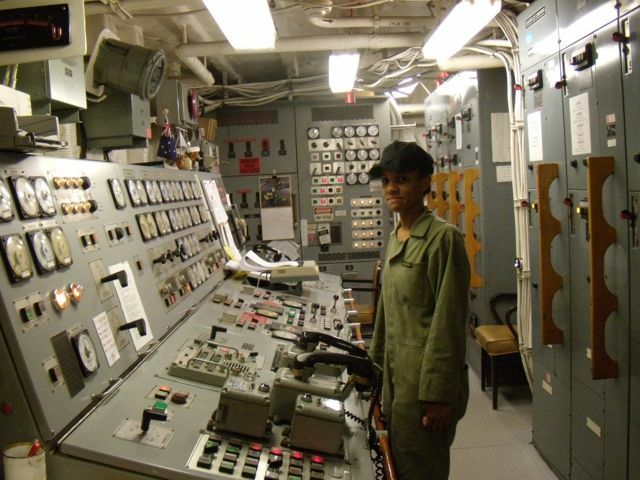 Afterwards I conked out for the rest of the day––even slept right through the needle-gunners vibrating the rust off of the bulwarks outside my stateroom. 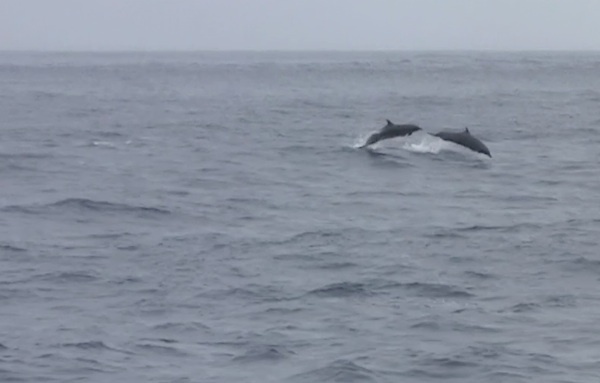 We did get a special treat that morning when a pod of dolphins played in the Melville's bow wake. After viewing them from the decks we ran down to the bow-dome, but by the time we opened the hatches the dolphins had already disappeared. However, they returned again this morning and Brent made it to the bow-dome just in time to capture some video. Sit back, relax, and enjoy the new video montage. April 28, 2010. KK: Here is Brent's latest cruise movie, perhaps inspired by the circles we've just finished deep-towing. April 27, 2010. KK: Today we had a fire and safety drill. 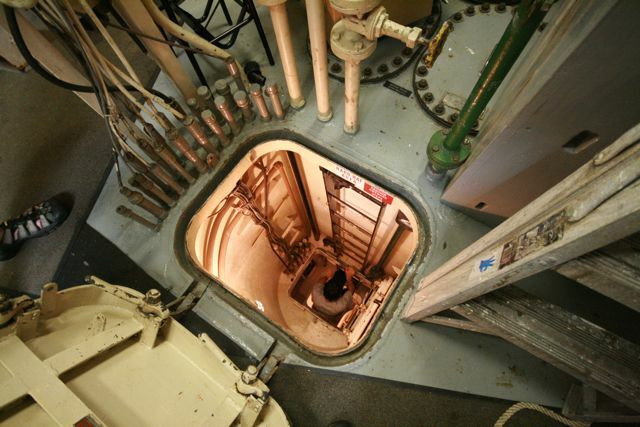 I was lucky to be pre-selected as the "victim", requiring me to feign injury by laying down on the warm metal gangway inside the Melville's engine room. Apparently I had gone down there to find steam to use in an experiment, but instead passed out in a safe and convenient position near the water-tight doorway. Miraculously my ear protection didn't fall off when I passed out, thus saving me from the deafening roar of two massive diesel engines while awaiting my rescuers.When the fire bell rang, the rest of the science party mustered in the main lab with their safety gear. It was noticed that I didn't speak up during the roll call and the bridge was promptly alerted. Shortly after this the Captain came on the radio stating that I was last seen near the engine room. The crew's fire-fighting team was then dispatched to search for me two decks below. Soon after three or four ( I had my eyes mostly closed) firemen in full fire fighting suits with oxygen masks found me in the engine room and carried my lifeless body over to the engineer's mechanical workshop, where I magically regained partial consciousness, thus saving themselves (and me) from being carried up two flights of stairs in a metal basket. Instead they carried the empty basket and I walked behind them all the way to the ship's hospital room, where I regained full consciousness with a mock-treatment of oxygen. I find it reassuring when the ships have these drills weekly since this practice could result in a life-saving difference if something bad happens. Today's rescue team did a good job. I'm sure i'd still be alive even if I had been stupid enough to go searching for steam in the engine room (duh, that's where you go searching for diesel fuel...). A view of the hangar and aft deck after sunset a few days ago. Our transmitter SUESI is dangling at the end of 7 km of deep-tow cable attached to the ship, which is visible from the sheave hanging on the aft A-frame and running above the deck to the block outside the hangar, where it turns down to the winch room below deck. 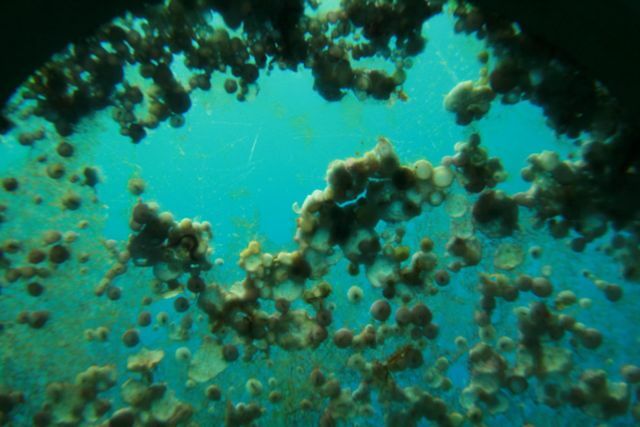 I have not seen that much marine life this cruise, but that may change during the upcoming instrument recoveries, since we often find stowaway critters tucked into the crevices of our seafloor EM receivers after they've been on the seafloor for a few weeks. 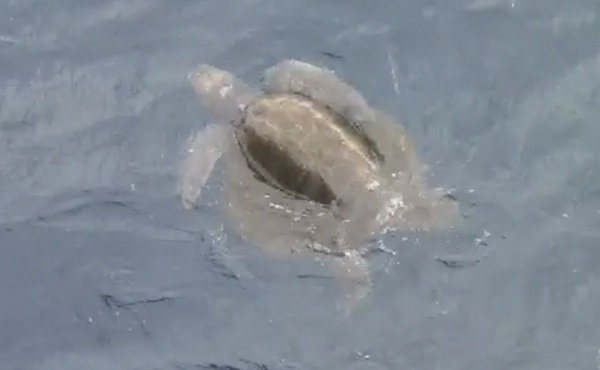 However, we have seen quite a few sea turtles. So far i've seen five (four of them on the same day). 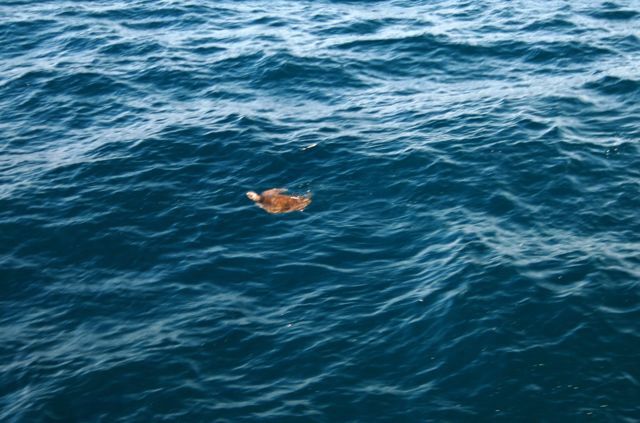 Here's a photo of one turtle that was about three feet long and just lazily floating around as the ship moseyed by at 1.5 kts. April 26, 2010. KK: As Steve likes to say during the deep-tow operations, "boring is good". Therefore, the past few days must have been good days. We have now gone around about 240 degrees of the second anisotropy circle and will complete it late tomorrow night. From there we will turn the ship so that we tow SUESI up the continental slope and over the shallow continental shelf towards the Nicaraguan coast. 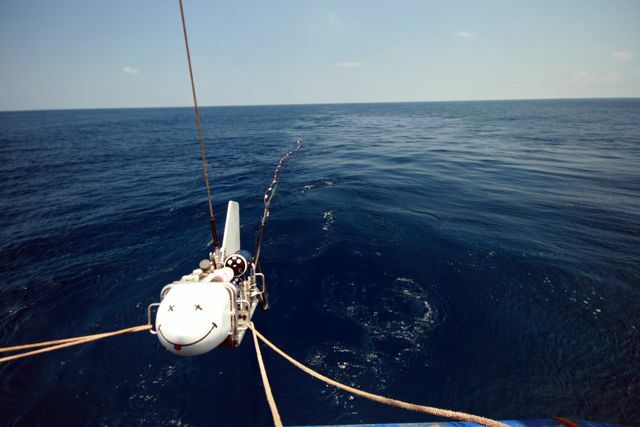 SUESI and the Barracudas keep on transmitting and pinging without any issues, and there's not much to do except monitor the winch control station and make sure SUESI stays above the seafloor. We did do something exciting today. The Melville's computer tech, Ben Cohen, took us on a tour of the underwater bow dome viewing station, which is basically a bunch of glass portholes in a metal tube that sticks out from the bow about 10 feet underwater. This photo shows Sam Zipper climbing down the 20 foot ladder to the viewing room. This is the view from the base of the ladder. The room is actually quite small, but appears spacious since I was using a wide-angle lens.The brass plates are covering the viewing portholes. 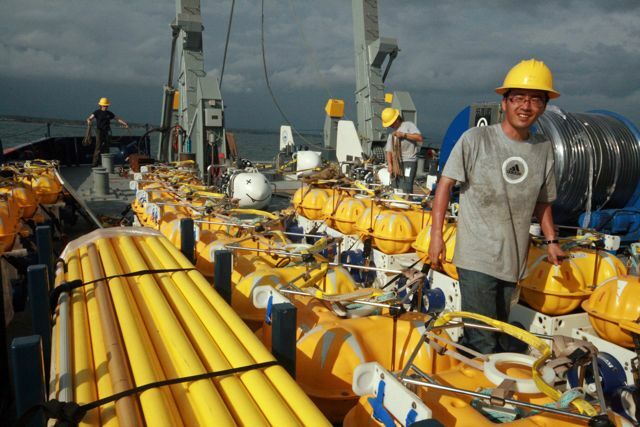 The pipes and valves on the left are used to sample clean sea water for chemical analyses. 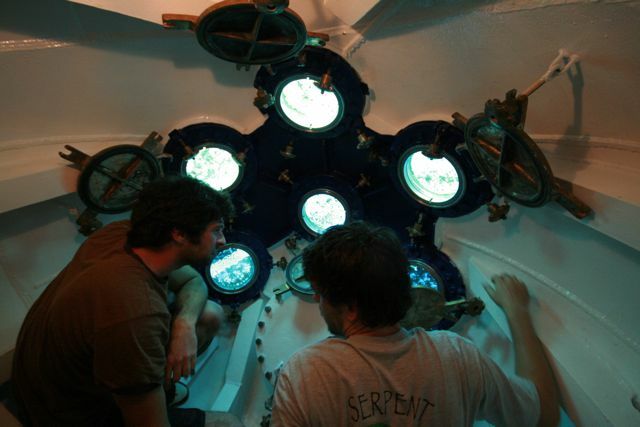 Here are Ben and Sam checking out the viewing portholes, which unfortunately had a bit of marine growth that mostly obscured the view of the bright blue water. Here's a close-up of a porthole with barnacles all over it. Staring at the lovely azure water made many of us wish we were back in the old days when swim-calls were permitted on research vessels. Like I said earlier, there's not much to do since everything is working well... Often during the endless days of deep-towing, our crew catches up on their reading, hones their knot tying skills and plays rounds of the card game Bang. There always seems to be someone who builds a miniature something or another. 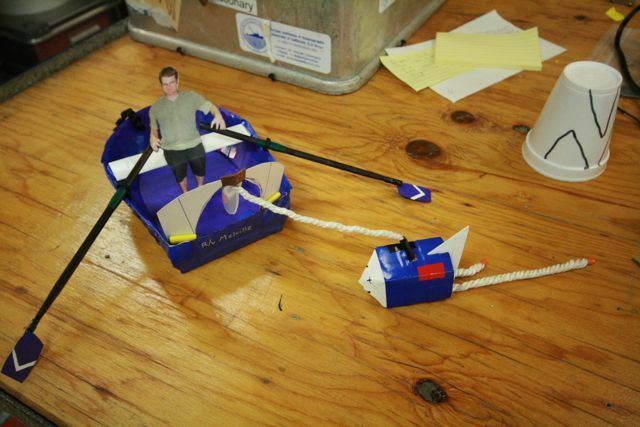 This time David and Emily built a mini-Melville and mini-SUESI and put me inside as the oarsmen. April 24, 2010. KK: We did it! Just crossed the trench axis and set a new depth record for SUESI at 5000 m. The crush depth of SUESI's weakest component, the commercial Valeport sensor which measures water conductivity, velocity and pressure, is 6000 m, so we were a wee bit nervous going this deep. SUESI's previous record of just under 4000 m was set offshore Central California. 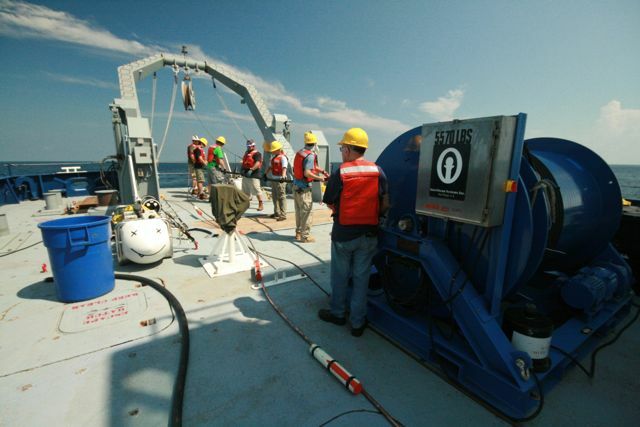 Furthermore, this is probably a world record depth for a marine CSEM survey, helped in part by this also being the first CSEM survey of a subduction zone. 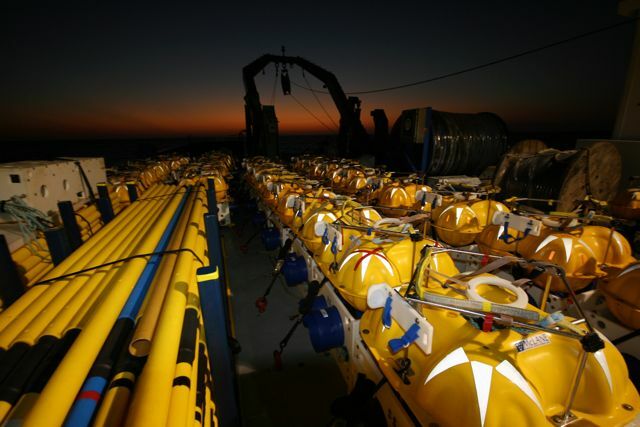 Most previous deep-water surveys have been collected at shallower depths on mid-ocean ridges or on the abyssal plain at about 4000 m; the majority of CSEM surveys are now collected up on the continental shelf for oil and gas exploration. Here's some photos of the deep-tow station at the record setting moment. Here you can see the trench bathymetry profile on the computer screen. This photo shows the Labview display for SUESI's vitals, including output current, component temperatures and most importantly altitude and depth (note the 5000.96 m depth). April 24, 2010. 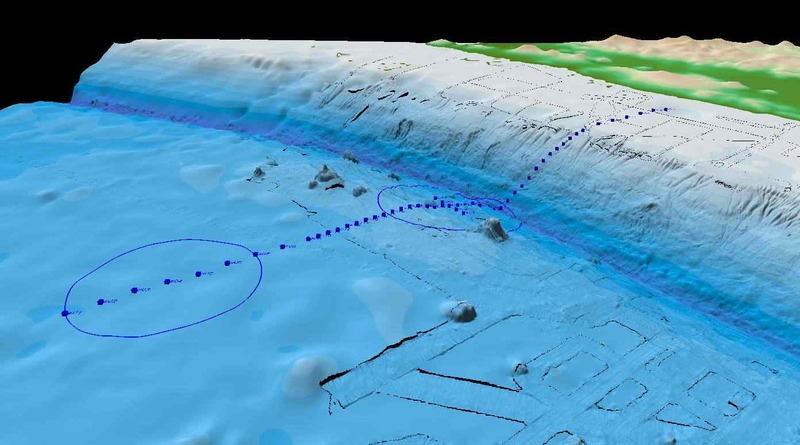 KK: We're just now entering the subduction zone trench. SUESI has crossed the first few faults without any problem with the rugged topography. By this evening we will have crossed to the landward side of the trench and will turn off onto the second anisotropy circle. We've been deep-towing for about seven days now and every moment is chock full of fast-paced action and quick decision moments, as encapsulated in Brent's new cruise movie. Enjoy. April 23, 2010. KK: Up late playing around with the data streams that SUESI outputs. Our engineer John Souders brought along a little widget that takes the RS-232 serial data stream from SUESI (which is transmitted up the deep-tow cable) and converts it into a mini-data server that can be accessed over the ship's network. I fired up the terminal program on my iPad, connected to SUESI over the ship's wireless network, and then she began talking to me, seriously, see the screen shot below. April 22, 2010. 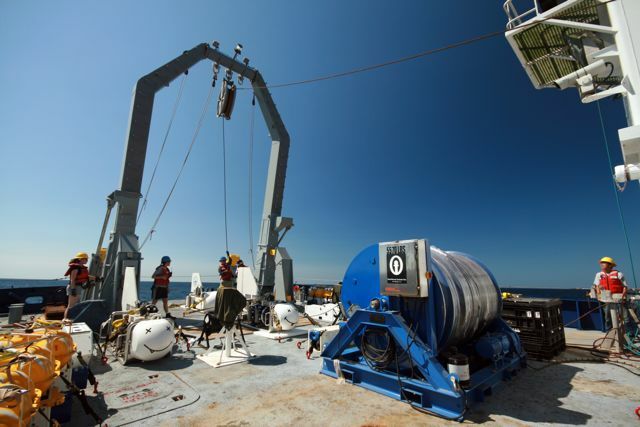 KK: After we completed deep-towing the first anisotropy circle yesterday we decided to beach SUESI on deck in order to swap out the Benthos acoustic ranging unit for another one that we expected to work properly. We use the Benthos unit to measure the acoustic ranges to two surface-towed acoustic transponders that we call Barracudas. Since the Barracudas radio their GPS positions back to the ship, we can feed that information along with the acoustic ranges recorded by the Benthos unit and SUESI's depth (as measured by her pressure gauge) into an algorithm that triangulates SUESI's location, as we did very successfully for last year's survey at Scarborough. While accurate navigation of SUESI's position isn't necessary for the data from the 30 km radius circular tow, it will be of great use on the inline tow that we are now collecting over the main profile of receivers. Since the first unit we sent down was returning obviously invalid measurements, we swapped it out with our second Benthos system. 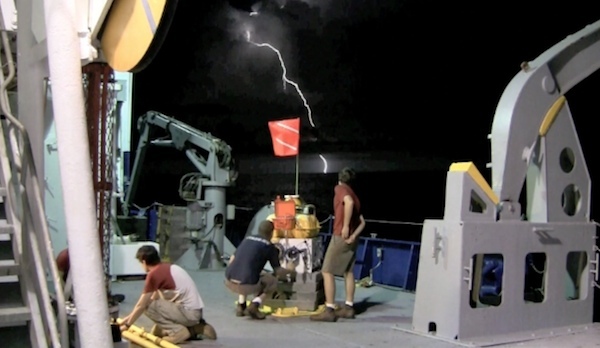 Things were looking better and we were able to record accurate ranges to the Barracudas, that is until SUESI went deeper than about 2 km depth on her way down to the seafloor. At that point the Benthos unit would only return noisy ranges, with the occasional range that looked reasonable. I stayed up late fiddling around with various gain settings on the system but to no avail. I concluded that we now had a working Benthos unit but that the Barracudas weren't working properly. Steve and I ran some more tests in the morning and verified that the remaining problem was limited to the Barracudas not being able to hear the pings from SUESI's Benthos unit. 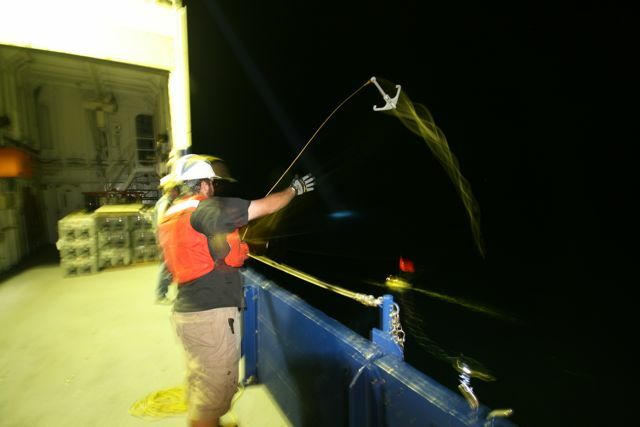 I suggested that we try dangling the acoustic transponders on a rope beneath the Barracuda paravanes so that they were out of the noisy turbulence and bubbles that form around the Barracuda's paravane system. In no time at all Steve transformed the aft hangar into a scene reminiscent of the TV show MacGyver (those of you who have been to sea with Steve will know what i'm talking about). Pretty soon we had a sturdy 4.5m long rope harness holding the acoustic transponder rigged up to one of our Barracuda paravanes. 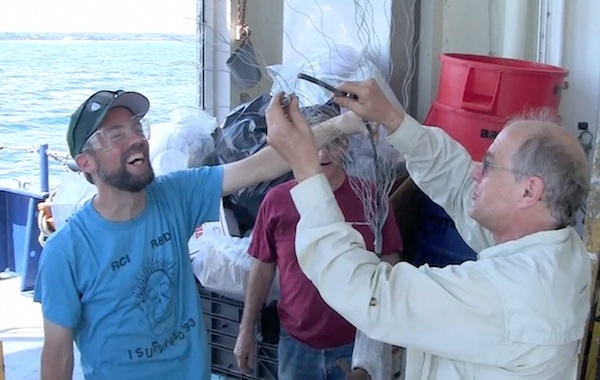 We deployed it off the starboard side of the aft deck and ran into the lab to see SUESI's Benthos unit starting to return correct range measurements to the Barracuda, as well as relays off a transponder mounted on the tail end of SUESI's 300 m long antenna (used to solve for the antenna's vector orientation). What a relief! Everything is now operating as intended. Like many field experiences in geophysics, things can go from grim to great with a little bit of time, patience and ingenuity. Thanks to the team for their hard work and perseverance today. Here's one of the modified Barracudas. The yellow material is thick plastic that in combination with the steel bridle acts as a paravane. The tube holds a blinking LED light, a GPS unit and a radio modem that sends its position back to the ship. 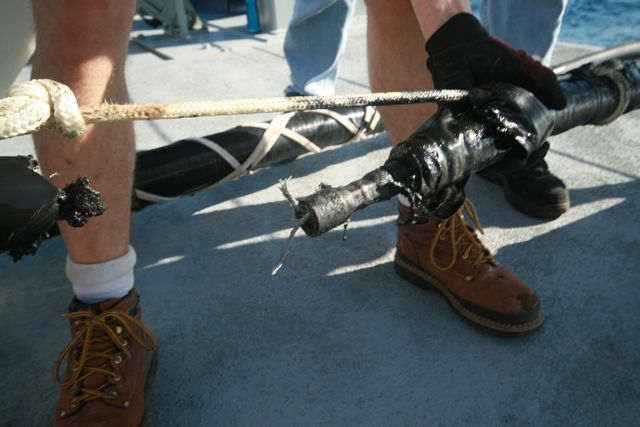 The rope harness on the bottom of the paravane (left side of photo) is about 4.5 m long and is attached to an acoustic transponder (not shown). Here's a Barracuda in the water just after deployment. We will let out about 500 m of line and the Barracuda will kite over far off to the starboard side of the ship. 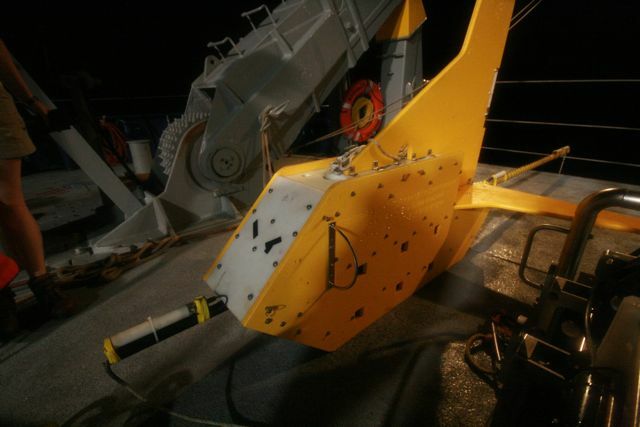 Along with another Barracuda deployed off of the port side of the fan tail, this system forms a several hundred meter aperture for acoustic triangulation of SUESI's position. April 21, 2010. 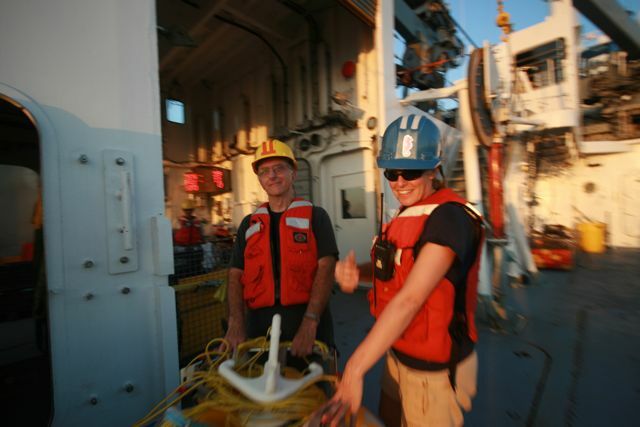 Arnold Orange: Liz Mack is Second Engineer on the R/V Melville and is a graduate of the Massachusetts Maritime Academy. 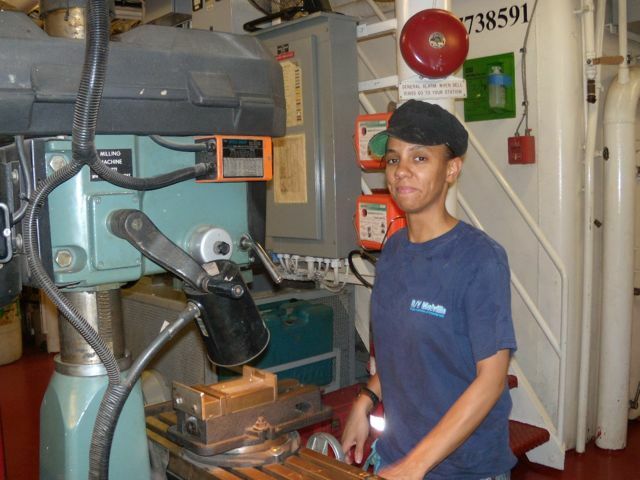 As a Melville engineering officer, during our SERPENT project she stands the 8 AM to noon and 8PM to midnight watches in the engine room and is responsible for the continuous and safe operation of all of the machinery and mechanical systems of the ship. 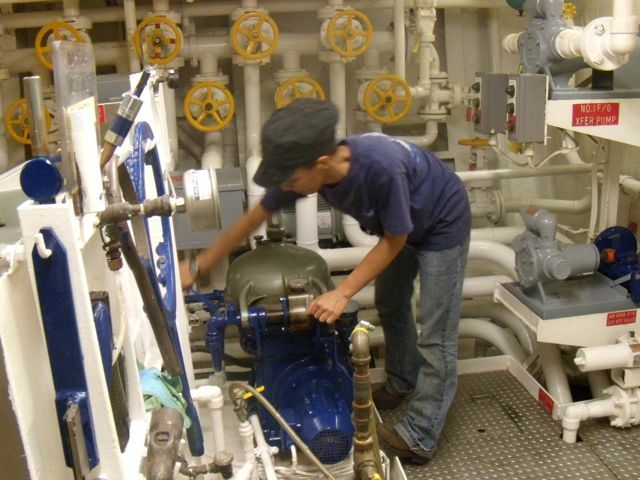 This includes a lot more than the engines that drive the ship – the air conditioning, water and sewage, pumps, compressors, winches, etc., etc., that we just assume will work when needed. April 20, 2010. KK: We've covered about 240º of the circular towpath now and should finish transmitting around the remaining 120º by supper-time tomorrow. Brent has cooked up another tasty cruise music-video, this time about the salty midnight-noon crew otherwise known as the Breakfast Club. Enjoy! April 19, 2010. 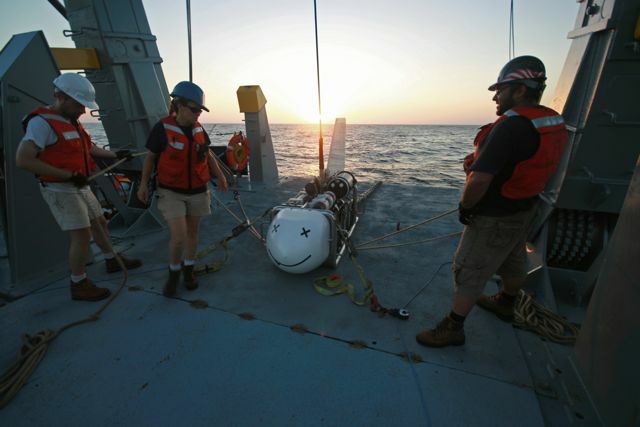 KK: Yesterday we deployed SUESI (Scripps Undersea EM Source Instrument). 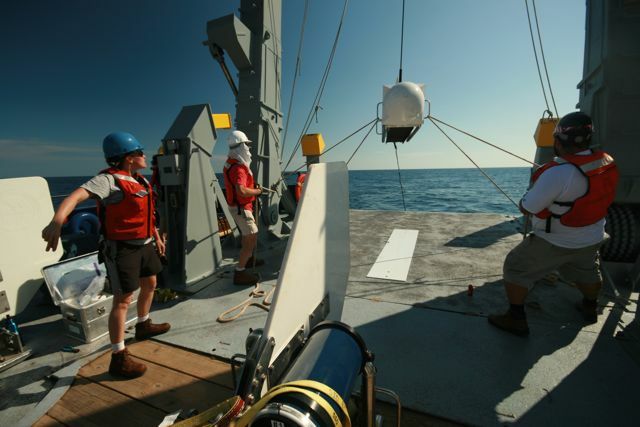 Actually, we deployed SUESI twice since we soon discovered a problem with our acoustic navigation system after the first deployment. 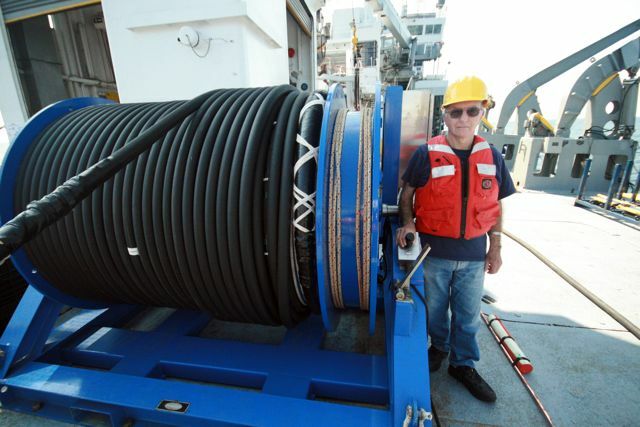 Since last night, SUESI has been transmitting 300 amps on a 300 m dipole antenna towed about 100 m above the mostly flat seafloor out here on the deep-ocean circular towpath (more on that in a few days). Its going to take another two days to finish towing this circle, after which we will then turn onto the main profile and head over to the circular towpath located in the trench. Below are some photos from the deck action yesterday. 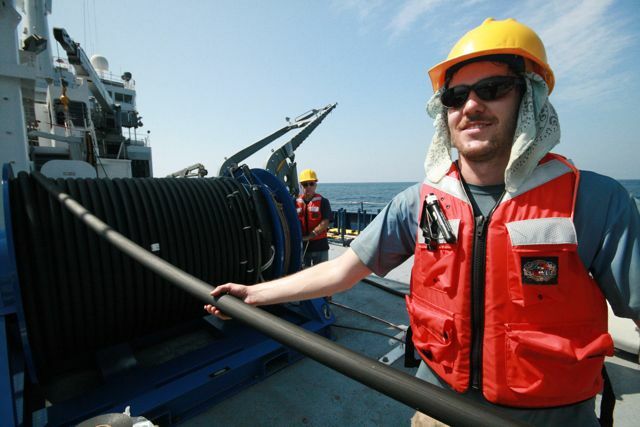 Those of you who followed our cruise blog from last year's project at the Scarborough gas field and the previous year's Gulf of Mexico CSEM for gas hydrate imaging project will recognize this person as Arnold Orange, an Associate Research Scientist at Scripps. 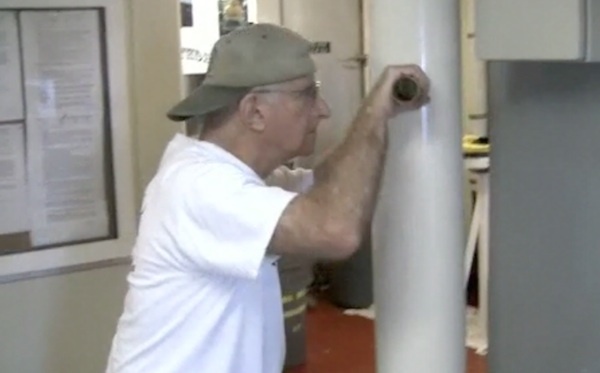 At 74 years old, Arnie is the most enthusiastic winch driver of the Marine EM Laboratory. Here's Arnie standing at the control panel for SUESI's antenna winch. 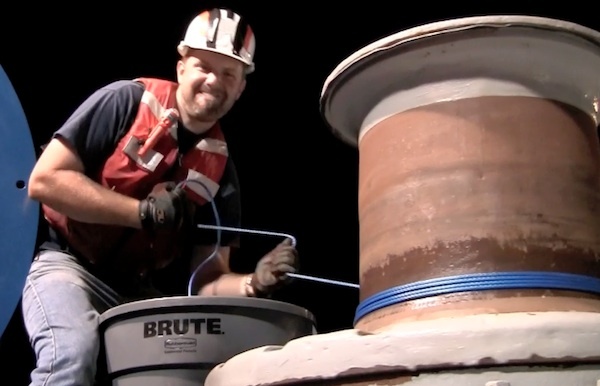 Here we are paying out SUESI's neutrally buoyant antenna. Sam Zipper dressed for safety and sun protection during SUESI's deployment. SUESI going out through the A-frame with Marine EM Lab student Brent Wheelock and technician Chris Armerding working the tag lines. Scripps resident technician Keith Shadle gives hand signals to the winch cable operator. Here you can see the near-section of SUESI's antenna streaming out into the seawater. The tail electrode section is too far away to see but extends 300 m further out. Our young apprentice Brent Wheelock has taken over as cinematographer this cruise, capturing life aboard the R/V Melville. Check out Brent's new movies by clicking on the video stills below (Quicktime format). 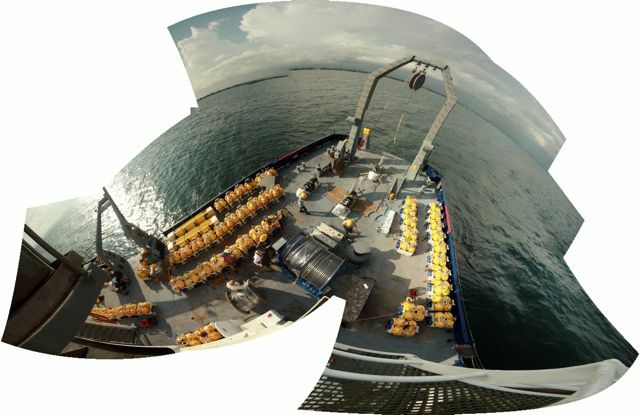 This is a view of the Melville's deck as we get ready to deploy the first of four LEMs. Most of the visible gear on deck consists of non-LEM related gear such as SUESI#1, SUESI#2 and SEUSI's big blue antenna winch, but you can see the LEM launch sled next to the people underneath the A-frame. 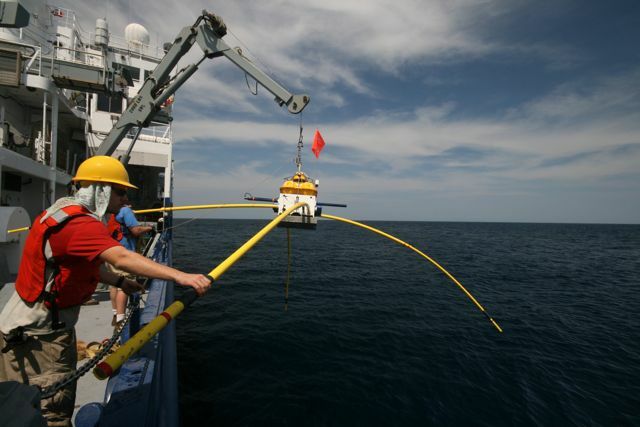 tag-lines during this A-frame deployment of the LEM and its deep-towed deployment sled. Here's a better view of the launch sled used to deploy the LEMs. The white rectangular instrument inside the metal frame is the LEM and the cable coming out of the back is the front part of the 200 m long dipole antenna. Once the LEM is in the water, it is lowered down by paying out the deep-tow cable at a rate of about 25 meters per minute. After a few hours it is finally close to the seabed 3700 m below the ship. At this point Steve checks the launch sled's acoustic echo sounder system to predict when it will be just a wee bit above the seafloor. 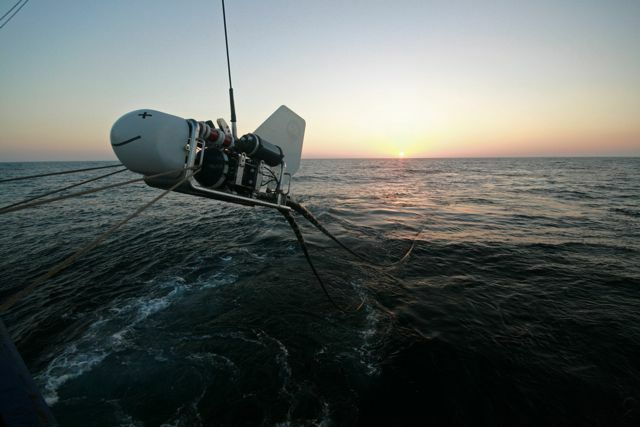 At the predicted time, the release is fired and the LEM will then glide down to the seabed. 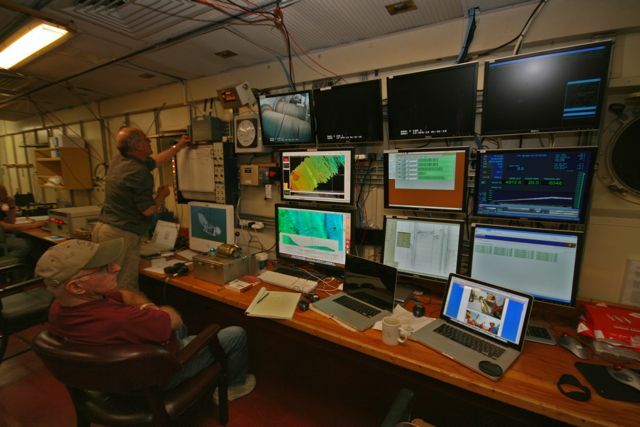 The photo below shows the lab where we sit during the hours of the LEM deployment. There are several camera displays, the most important being the deep-tow cable drum camera that we monitor to make sure the cable is winding or unwinding properly. 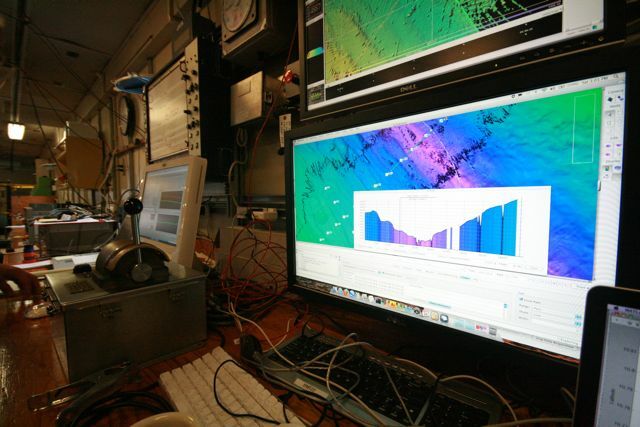 Other displays show the ship's location, course and speed; winch wire out and tension; multi-beam bathymetry acquisition; 3D seafloor bathymetry with EM receiver way points and ship's current position; the output of the 3.5kHz sub-bottom profiler; and most importantly the status of the ship's satellite internet connection. Arnold Orange is seated in the the chair and Steve Constable is standing. The first of the styrofoam heads has returned. This one was secured inside a T-shirt which was tucked in the nose-cone of the LEM sled for a 10 hour dive down to 3700 m and back (a pressure of about 5400 psi). This shrunk much more than expected (to about the size of my fist) and is now solid feeling. Despite the long seawater bath, it still reeks like permanent marker. The rest of the heads went down with the trench EM receivers so we won't see how they turned out for another few weeks. April 14, 2010. KK: The survey has begun. We're on station and deploying EM receivers like crazy. Since arriving at the survey profile 10 hours ago, we've made 13 deployments...only 41 more to go! Here's some photos of today's action. Jimmy Elsenbeck and Sam Zipper. Karen Weitemeyer, Keith Shadle and Chris Armerding. 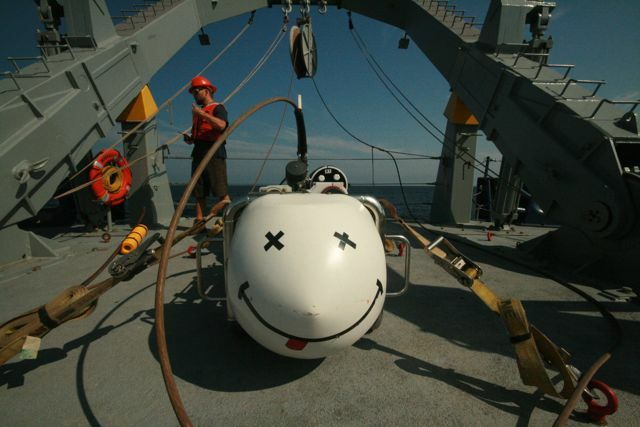 Sam Zipper using an electrode arm as a tag-line during the deployment of a seafloor EM receiver. About eight of our MT/CSEM stations are located at ocean depths of 4000-5200 m, with pressures in excess of 40,000,000 Pascals (5800 psi). 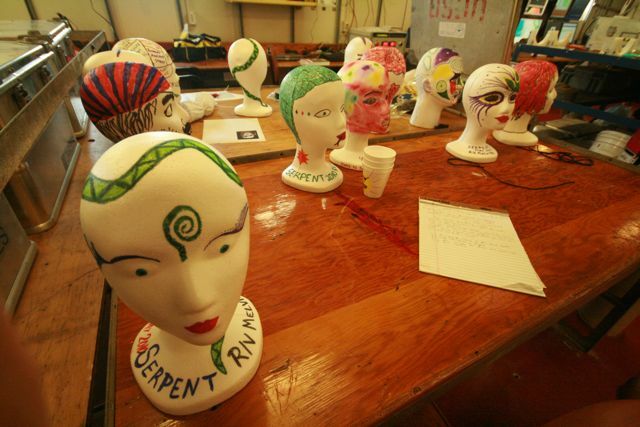 We're going to find out what happens to these styrofoam mannequin heads at such pressures. Here's the before photo; stay tuned for the after photo in about three weeks. April 12, 2010. KK: Another day with the marine EM team laboring away in preparation for tomorrow afternoon's departure. Nearly all the deck equipment has been secured and much of the lab gear is ready to go. Here's a few photos from today's activities. WHOI postdoctoral researcher Tetsuo Matsuno (front right), Scripps postdoctoral researcher Karen Weitemeyer (back right) and WHOI Ph.D. student Emily Carruthers (left) finishing up after a hard day's work organizing marine EM receivers and transmitters on the Melville's deck. Here's the water-taxi that takes us ashore for beers and tasty Costa Rican dinners. 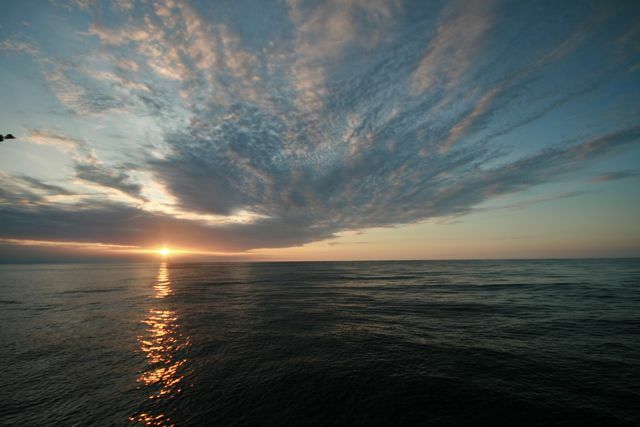 Tonight was our last taxi-trip before the 30 day sea-going expedition begins tomorrow afternoon. The R/V Melville viewed from the water taxi. Sorry for the low quality photo; I only had a cell phone camera with me at the time. April 11, 2010. 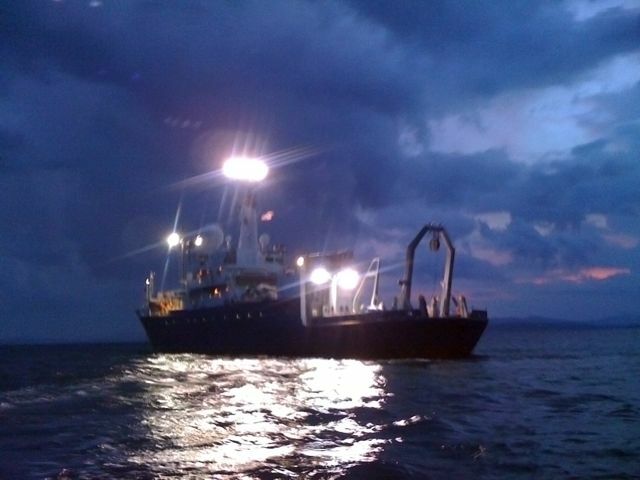 KK: Spent our first night aboard the R/V Melville last night while anchored off of Puntarenas. In the morning we rode down to Puerto Caldera, and after a little hiccup with the port schedulers, we were able to slip in between two giant ships. We then spent a grueling afternoon loading all our equipment on board. It's amazing to see how fast things went. 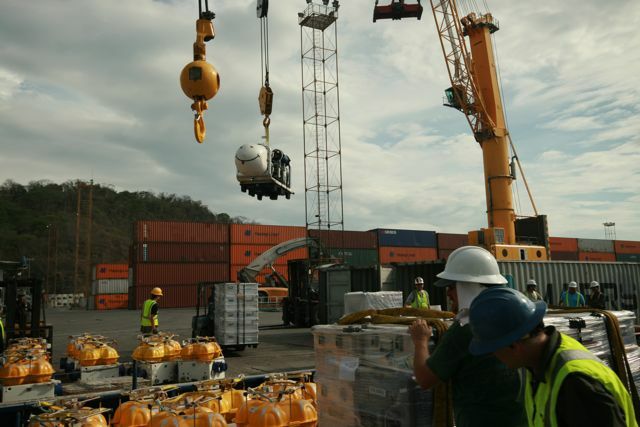 Three cranes, two forklifts and about 20 of us were able to completely unpack three 40' shipping containers worth of Marine EM instrumentation and load it aboard the R/V Melville within about six hours. We still have lots of securing and setting up to do, but that's why we have two more days in port. Kudos to the SIO team and our new colleagues from WHOI, all of whom did a great job despite the toasty Costa Rican weather. March 30, 2010. KK: Getting ready for the cruise. Here's the cruise t-shirt logo that Steve and I designed. Thanks to Claire Constable for drawing the snake's head.